Every now and then, we have customers asking for recommendations for a good hand grinder and where to get one. We encourage customers to invest in a good hand grinder. Why? It all boils down to freshness. We advocate “grind-on-demand”, just like how we prepare coffees in our shop. Pre-grinding your coffee days or weeks(!) before you brew it speeds up the staling process of the coffee significantly. You will notice that the grinds lose their fragrance, resulting in a less flavourful cup. Exposure to oxygen and moisture accelerate the ageing process of the coffee. Although one cannot see any visible change to the roasted coffee as it becomes stale, the flavours and aromas have already disappear by the time you start to brew that cup. 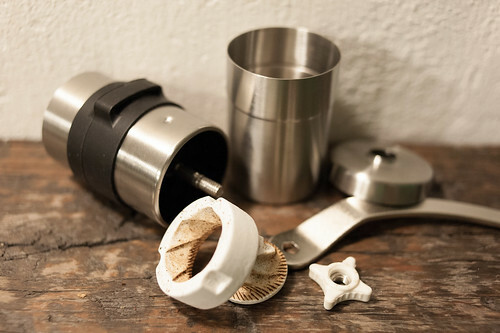 While proper storage helps to extend the freshness of the coffee, grinding before you brew does wonders. The good news for consumers is that there are affordable hand grinders out there that will do the job without burning a hole in your pocket. We used to direct our customers to departmental stores or other cafes which retail brewing accessories to grab one as we did not carry any hand grinders in our shop. We felt this was a disservice to our customers as it is one of the most important brewing accessories one should have at home or in the office. Hence, we decided to bring in a hand grinder which we feel is of good quality, compact & handy, as well as reasonably priced. After much research and from past experiences of using different hand grinders available locally, we decided to bring in the Porlex Mini ceramic mill. 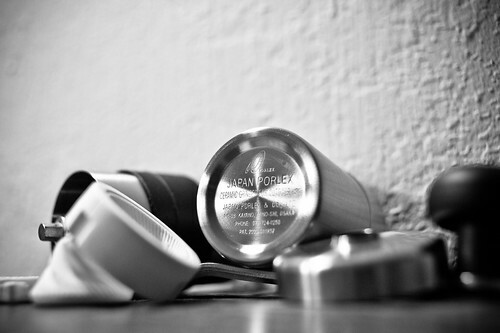 Porlex is a Japanese company that specialises in ceramic food grinders/graters. While not as well-known as Hario, it is gaining popularity, especially in US, UK and Australia. We like the well thought-out design of the Porlex Mini. A unique feature is the silicon band which gives a firm grip around the cylinder while grinding. 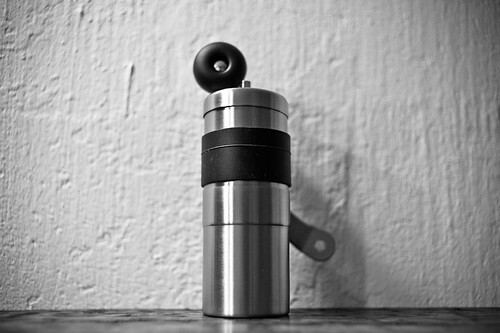 The handle can be stored alongside of your grinder when you are not using it. The grinder’s inner spring helps maintain the grind consistent regardless if grinding for coarse brewing. The stainless steel body makes the lower compartment which holds the ground coffee static-free. The ceramic conical burrs are easy to clean and durable. 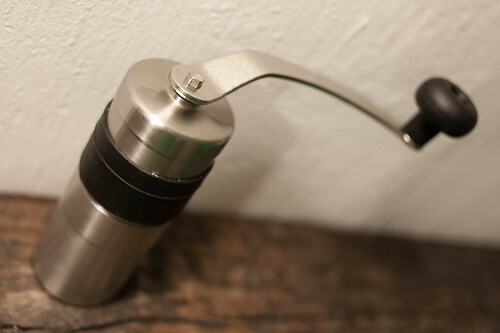 We like the ergonomics of this hand grinder in terms of the feel and ease of use. Its stainless steel frame is also a notch more aesthetically attractive compared to other hand grinders in the market. This impressive compact hand grinder will be a great travel companion when you’re stuck in a country without good coffee (brew your own!). For all the home brewers out there without a hand grinder, it’s time to make the leap to the next level of grinding your own beans! We are retailing the Porlex Mini for S$75 and new stocks have just arrived. To encourage more home/office brewers, we are offering a 10% discount for a brewer kit – Kalita wave dripper, Kalita wave filters & Porlex Mini ceramic burr hand grinder. Drop by and grab one soon – while stocks last.